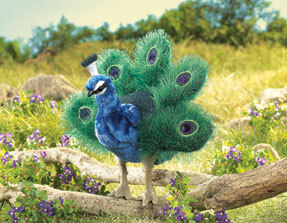 FACTS OF INTEREST: There are three species of peafowl. The males are called peacock; the females, peahens. The Indian peafowl is the best known. Only peacocks have the long train of colorful feathers. In the mating season, they strut in front of the hens with their feathers spread wide. The peacock’s train is not its tail. Short tail feathers grow under the train. Special feathers called coverts raise the long plumes of the fan. As early as 1000 B.C., traders brought peafowl to the courts of Egyptian kings. Peafowl now live all over the world in parks, gardens and zoos.